Introducing the new EVO®. Refined for superior performance, the third-generation EVO® provides ergonomics and space savings in a sleek monitor arm. EVO® supports the monitor with true constant force, ensuring smooth movement across the arm’s entire range of motion. It’s easier than ever to mount a flat panel monitor while complementing any workspace with EVO’s modern design. 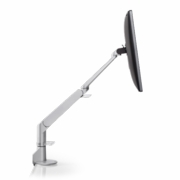 Effortlessly reposition with one-touch monitor adjustment. Easily rotate flat panel monitor for portrait or landscape viewing. The height-adjustable provides 10.4″ of vertical range and horizontal range up to 18″. Supports one monitor with a screen size up to 27″.